Ah yes, the Bedlam in Goliath - when I found this page on these forums, i was suprised to find that this album is so... divisive. Since this is my first review, I probably won't make this too long-winded. That being said, I think this album is exceptionally good - one of my favorites for sure (right behind Frances the Mute and Amputechture for me). 1. 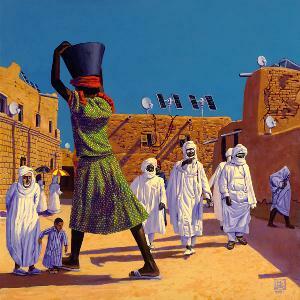 Stunning musicianship is found on this album, as is the norm with the Mars Volta. Dare I say, some of their best work with songs like "Goliath," "Metatron," and "Was Simulacra." 2. Energetic. Holy crap, the momentum this album has is ridiculous. While some people listen to this album and hear a disjointed mess, I hear some of the Mars Volta's most climactic and fast-paced songwriting to date. Is it a little bit entropic? Sure. But is it forward-driving and consistent? Definitely. 3. Experimental. As per usual, the Mars Volta does something different with this album. While sometimes this can be iffy (I'm not a huge fan of the robot voice in "Askepios" and "Tourniquet Man"), the sophistication in songwriting doesn't disappear amidst the shouting, heavy percussion, and guitar solos. 4. Great songwriting. Many of the songs (at least to me) are memorable. The endings to songs like "Ouroborous" and "Goliath" are some of their most climactic, exciting works yet. Songs like "Cavelettas" and "Soothsayer" continue the Mars Volta tradition of messing around with time signatures and dissonances to create an odd, but haunting feel. The (potentially) bad things about this album: 1. It lacks the slower, eerier moments of albums like "Amputechture" and "Frances the Mute." Almost the entire album is a wall of sound. This can make it a bit jarring for a new/ inexperienced prog fan and/or Mars Volta fan. 2. It isn't as punkish as Deloused, but does go a little bit more towards the energetic punkish vein. It is at a bit of an odd place between Deloused and Frances/ Amputechture. I could definitely see where the complaint that this album is inconsistent or doesn't know what it wants to be might come from. 3. As aforementioned, the experimentation sometimes feels unnecessary and egregious. This is a nothing complaint for me, but its worth mentioning - this isn't a great album for somebody new to this band.